I hope everyone's having better weather than we are.....but on the bright side; yucky weather makes a PERFECT stampin' day!!! My post for today is showing you one of my swap cards that I'm taking with me to the MN SU! Regional this weekend. I cut everything not knowing what I was going to actually do & after toying with it for a while; this is the end result! I'm making 24 of these and then I'll move on to something else......blame it on short attention span or something but I CANNOT make hundreds of the same thing over & over again!! My max is maybe 30 but in this case, I went with however many strips the DSP would give me....smart move if you ask me LOL!!! I'm off to finish these up; work on more laundry and *possibly* cook. So many distracting things and too little time left before I leave!! I think I'll put my crock pot to good use this week....that'll free up LOTS of time!!! Thanks so much for stopping by and have a great rest of the day! Jackie this is great. I love your die cut butterfly and the colors are great together. I've been slowly getting into the kraft cardstock finally. This is a gorgeous swap piece! Lucky ladies who get one too! I'm with you.... I can't make more than 2 doz. of the same thing! Boooorrrriiiinnnnggg! Crock pot = great idea! Have a wonderful time at the Regional - lucky girl! Very pretty Jackie! I can't imagine making so many of the same card, not sure I could pull off 30 let alone 100. I like your idea of making more than one style. Have a lovely quiet Sunday. So pretty! I love the contrast of the kraft and the bright colors. This card is beautiful. I hope the weather brightens up soon for you. Ohhh. Pretty! That butterfly goes on everything! very pretty card hun!!! Love the colors and layout on this. Our weather here is YUCKY today, its soooooo windy that my baby boy Boots (cat) flew up over my craft tables to get to the window to see what the heck is going on...lol it was nice yesterday, but yuck today!! Great design and good luck at finishing them all, I also find it difficult to do too many of the same, again I love the colours you used. Nice job Jackie. I love how you embossed the butterfly then cut it out. Enjoy the Regional. Hopefully Shelly will be there (she wasn't at either of the recent Canadian ones). Ooh I really love the colours on this card, chocolate chip is one of my faves! The weather isn't *too* bad here in the South East of England, but could be better! What a pretty card - love that background stamp, I am waiting for it to be delivered right now! Thanks for sharing - glad you enjoyed your rainy day. the chocolate is very striking with the other colors! Pretty! Gorgeous card, Jackie! I love these colors together! This card is fabulous Jacquel! 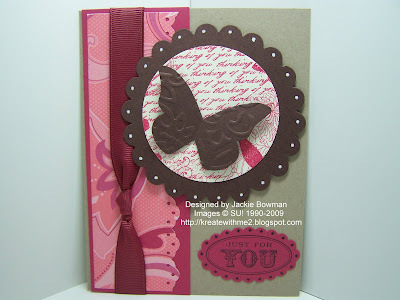 Love the colors you have used and the butterfly is such a sweet detail! Such a pretty color combo. The embossed buttefly reminds me of Easter chocolate. Boy I could go for some of that right now! I mass produce my Christmas cards and usually make about 45 of them. But I really get sick of looking at them after that many. Good for you for being able to create so many of these and for coming up with a plan B so you don't go nuts with only one design. Beautiful card! Love the Fresh Cuts as the background of the circle. I am with you on making hundreds of the same. I usually make 20-30 of the same and that is plenty! Have fun at Regionals! Jackie, love these colors together. I love the background with the butterfly. So pretty! I can't make more than ONE! I get restless. There are just SO many ideas that float around in our brains. I won't live long enough if I lived to be 200 to get all the cards done that I want to make! I love this card!! The colors are gorgeous!! Jackie, what a really great card! I love the colors and layout! This is gorgeous! Love the chocolate butterfly and the scallops! I hear you jackie I hate making more than 30 of something and I often do. Love that pink and chocloate card great job. Beautiful!! The ladies who get this one will be lucky! It's hard making two of the same, let alone 24!! Oh so gorgeous Jackie!! I love that butterfly!!! ;) TFS! This is really pretty! love the butterfly~! This will be a big hit at the swaps. Gorgeous. Amazing card Jackie!!! Love the detail... dots around the scallop edge, embossing on the butterfly, the knot tied in the ribbon, and the gorgeous color combination.